Yesterday was the first official day of spring and I don't know about you, but I was super excited to see it! February teased us with spring-like weather here in NC and then March came in like a lion and everything got frigid! This made the first couple of weeks of my spring capsule wardrobe very interesting. One of the reasons I've heard that people are scared to do a capsule wardrobe is uncertain weather. By God, we have that in NC, so I thought I would share how I've handled the first three weeks of this capsule. February was in the 70s and I was oh so excited to swap out my fall and winter clothes for the pretty colors of my spring clothes. I swapped capsules the week that finished out February and started March. 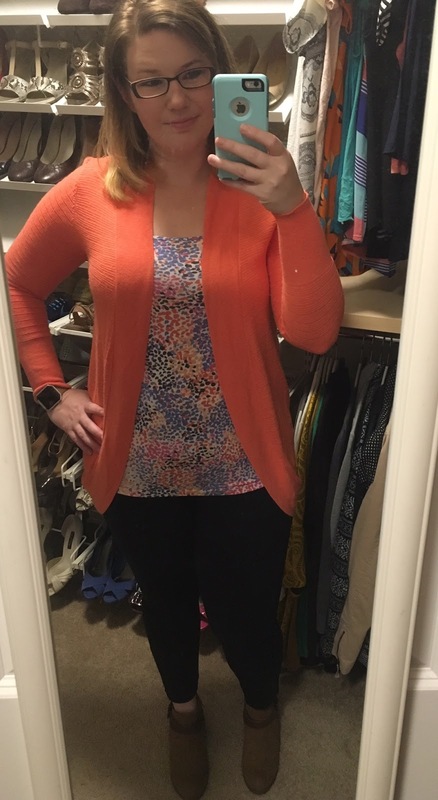 The weather was gorgeous and I was feeling confident in my spring choices - plus I had a new LulaRoe skirt that I was dying to wear! 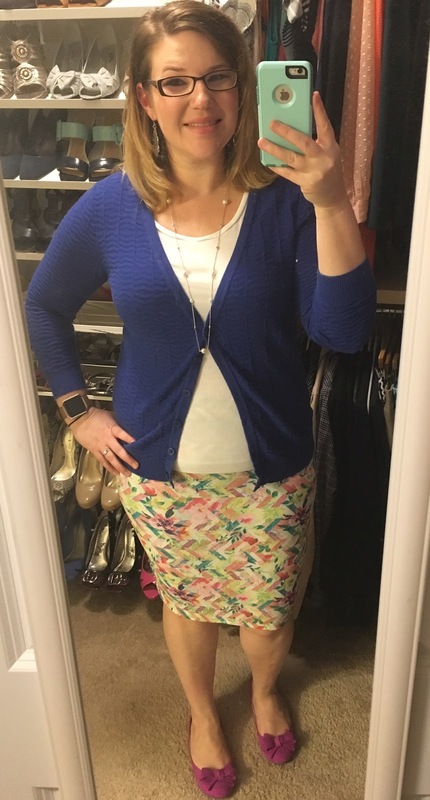 For this outfit, I paired my LulaRoe Cassie skirt with a white t-shirt and beloved blue Merona cardigan from Target. And because I had all these awesome colors going, I added my favorite magenta flats (can be found here). This was my first LulaRoe Cassie skirt and I was a little worried because I got a medium. But it fit perfectly and was wonderful for my ego! I'm also really excited for it to get warmer because I just got a new purple t-shirt that will also match this perfectly. Then the weather started to go downhill. Most of this capsule is layering pieces, so I had to get creative. 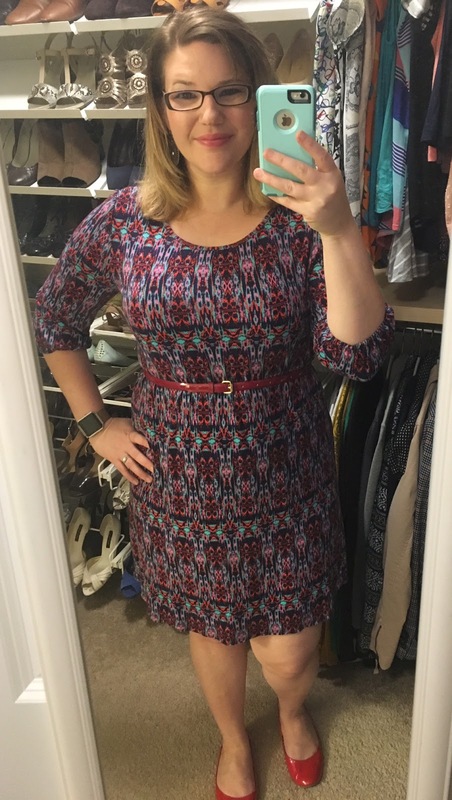 I started with dresses, thinking that I was mostly going to be in my office. Side note - I haven't been able to wear that skinny red belt in years. No, really - years! And now I'm on the second notch in, woo! Anyway, this is my favorite dress. I throw a black cardigan on over it if I'm cold and call it a day. And if I'm feeling fat and lazy, I don't wear a belt. So many options! But then the weather got colder. And things got interesting. I went through all the cardigans. And then, I cheated. I hadn't done laundry, both of my warm weather sweaters were in the dirty laundry, I'd worn a bunch of cardigans already that week and it was going to be a super cold day. So I cheated. Already. Less than a month in. 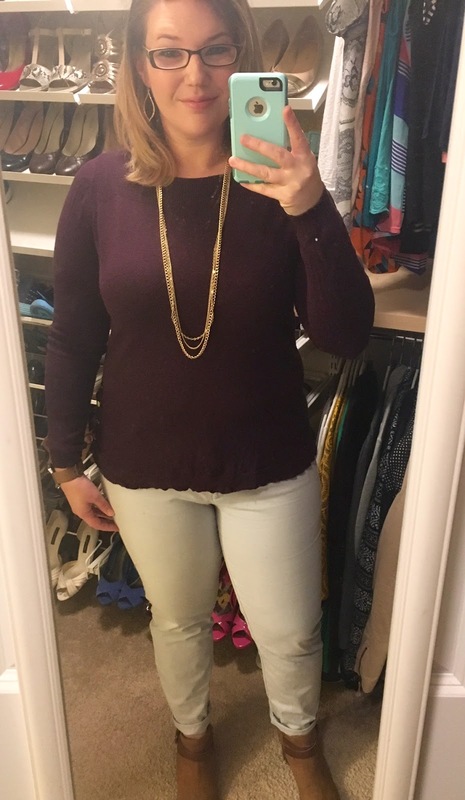 I pulled out a sweater from my winter capsule and called it a day. Cause sometimes, you just need to be warm. Also, these booties are the best $30 I have ever spent. I've had them a full week now and I've already worn them three times. Finally, it was a Friday and I was feeling like wearing my LulaRoe Randy tee. It's not the dressiest thing in the world, but Friday is dress down. 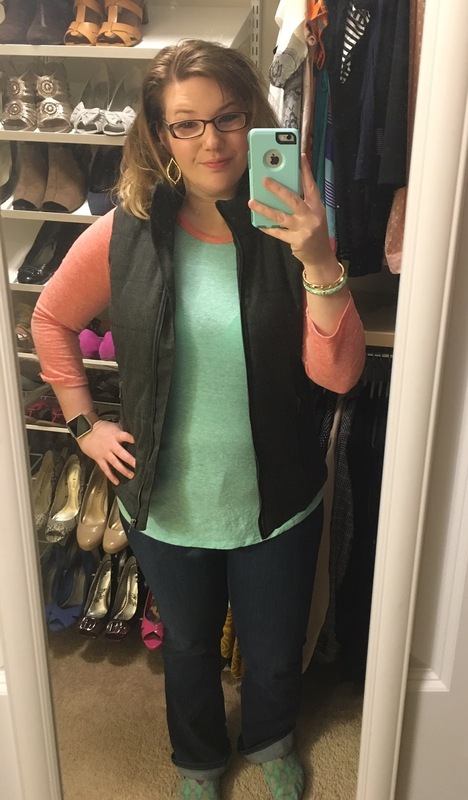 It still didn't feel work-appropriate, though, so I popped on my vest from Stitch Fix. 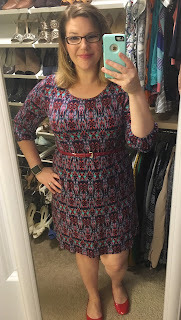 This post is also a really good example of how you don't have to buy new clothes when you do a capsule. Most of my clothes are from a few seasons (okay, years) ago. They are what fits now and I don't really have a huge budget to replace them. But adding in some new shoes (booties!) and other pieces like a vest, fun skirts or camisoles can really help update them. The lesson is this: weather is weird. It's going to be weird, especially if you live in North Carolina or anywhere, really. I think I saw on the news that the last cold snap is normally some time in April, so I still have some weeks to go. Sometimes you might have to cheat and pull an item out that isn't in your capsule. I don't recommend it, but life goes on. But I still like my capsule. Mostly because it does make me think about different ways to wear my clothes and how to style them instead of wearing a cardigan, shirt and jeans every day of my life (cause that's what would happen). It also allows me to really think about what I'm buying and buy things that I will wear all the time, like my booties. So, did you survive the cold? Have you swapped your clothes out for warm weather stuff yet? And am I the only one wanting to wear furry boots to work?